Story: Everything that you eat has a mood or a feeling associated with it.. Pizza and beer = game night, Til-gud = Makar Sankranti, Mithai mixed with the smoke from fire-crackers = Diwali, Hot pakodas and chai = Rainy evening.... and then there are some food items that give you a sense of satisfaction that cannot be described.. a sensation that satisfies the soul. What's your comfort food or soul food? - Mac-n-cheese / pasta / Kadhi-khichadi / Daal-chawal / Sabji-and Hot Roti? This amti/daal is one such food item for me.. Mix it up with small sqaure pieces of roti with lots of pure desi ghee on it to make Policha kala! or Eat it with chawal and dahi and mango pickle.. oh.. it is sooo satisfying.. I am not sure why - but in my mind comfort food is almost always something you ate regularly as a child. May be because it reminds you of the first time you felt that satisfaction from food... it reminds you of your Mom cooking simple yet unbelievably satisfying meals.. This Chincha-Gulachi Amti reminds me of all that..
For those not familiar with the term - Chincha-Gulachi Amti is a sweet and sour lentil soup - of course the English translation takes away the charm. Pressure cook the toor daal in 2 cups of water (twice the amount of daal). Once the daal is cooked, mash it well so that it becomes a uniform paste. Mix a little bit of water to make a smooth paste. Now add tamarind paste, gud, salt, kala masala and mix well. Taste and add salt and gud to taste. Now make tadka - heat the oil in a pan, add hing and mustard seeds to hot oil. Once the mustard seeds start to splutter add curry leaves and green chilies. Add the daal mixture to the hot pan. Mix well with the tadka immediately. Add a warm water as needed to get a liquid consistency and mix well. 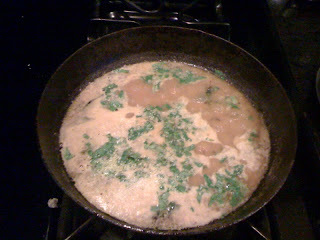 Cover the lid and let the Amti / lentil soup simmer for 3-4 minutes. This step is very important.. if the daal is not boiled enough - it does not soak all the flavors from the tadka. Garnish with fresh grated coconut and chopped coriander leaves..
Anuja, Very apt about the comfort food description :) Could not agree more on that. I think I may have just found the dal recipe I sometimes dream about..long long ago I had a simple lunch at a Maharashtrian friend's house and I remember falling in love with the dal her mom served us. This may just be that, the only thing I remember from her dal was that it had coconut in it. I never thought of asking you, now I cannot wait to try this!! :) happy to hear all that.. I have lots of Kala Masala at home if you want some.. This sounds yummy. I should ask Divya to try this! !